VILLAS AND APARTMENTS TO RENT IN ALHAURIN EL GRANDE, SPAIN. 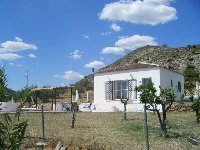 Welcome to our selection of holiday homes to rent in Alhaurin el Grande, Spain. Located in the mountains overlooking the Costa del Sol, around 30 kilometres from Malaga, Alhaurin el Grande is known as one of the most picturesque villages in the region. It's height, at over 200 metres above sea level, means visitors can enjoy spectacular views down to the city of Malaga and the Mediterranean, plus along the Costa del Sol itself and towards the neighbouring village of Mijas, one of the most popular tourist destinations in Andalucia. The village itself has little accommodation to offer, apart from a few guest houses or holiday rentals, and only small bars and restaurants serving local specialities. However, the coast is only a short drive away and the larger nearby town of Alhaurin de la Torre has all the practical amenities that tourists may need. The village itself is very picturesque, with winding, narrow streets that are great for visitors to explore but not so great for locals to drive around. If you're planning on visiting Alhaurin el Grande, it's probably best to leave your car on the outskirts of the village, rather than getting snarled up in the daily traffic jams. There are a number of religious buildings in the town, including a sixteenth century chapel, as well as the remains of historic sites in the surrounding countryside. The three Roman pillars that can be seen in Alhaurin el Grande's main square were brought into the village from a nearby archaeological site. There are other Roman ruins in the hills around the village, as well as the remains of a Moorish fort. As well as being home to hidden historical remains, the countryside around Alhaurin el Grande is ideal for walkers, with plenty of marked routes of varying difficulties and lengths. Many of the trails from the town will take you further into the mountains and woods where visitors can enjoy even more spectacular views than you get from the town itself. There are also outdoor activity centres in the region, allowing tourists to try out typical countryside activities such as horse riding and even clay pigeon shooting. Golfers are well catered for, with two courses in the vicinity of Alhaurin el Grande. The closest to the village is the Alhaurin el Grande Golf and Country Club which actually has three courses, an 18-hole course for adults, an 18-hole course for juniors and a 9-hole course, all designed by the legendary Seve Ballesteros. Looking for self catering holiday accommodation in Alhaurin el Grande? Then below is a selection of apartments in Alhaurin el Grande and villas in Alhaurin el Grande that can be rented direct from their owners. You can either click on each listing for further details or you can use our search engine on the left if you are looking for something in particular. Church of Our Lady of the Incarnation - The Church of Our Lady of the Incarnation was built under the patronage Catholic King and Queen, Isabel and Ferdinand after the Conquest of Setenil. Under the supervision of Friar Diego de Deza, they started work building the church early in the 15th century in the year 1505. At the beginning of the 17th century, Pedro Diaz de Palacios continued with the work on the church. The central nave and fa�ade were never built as the work on the church was halted in 1614. Golf - Why not take a swing at golf? At the Alhaurin Golf & country club you have up to 3 golf courses on offer. Firstly, there is an 18-hole; par 72 course on offer has challenging holes, lush green fairways and greens set amongst pine woods. Secondly, there is a 9-hole course surrounding a beautiful lake. Lastly, there is a junior 18-hole course in which adults may only participate when accompanied by a child. Alhaurin el Grande is located in the mountains overlooking the stunning Costa del Sol. Alhaurin el Grande is known as one of the most picturesque villages in the region. Being situated 200 metres above sea level means visitors can enjoy amazing views of the city of Malaga and the Mediterranean, and along the Costa del Sol itself and towards the village of Mijas which is one of the most popular tourist destinations in Andalucia.